In my early days of cooking I had a reputation for catching things on fire. In our house growing up, I caught Easy Mac on fire because I forgot to add the water to make macaroni and cheese. I just stuck the noodles in the microwave, pressed start for 3:45 and next thing I knew, I smelled smoke and saw black, shriveled noodles! Another example was just few years ago when I was in college at Texas A&M University. I was broiling salmon, and the recipe said to drizzle olive oil on the fish. Well, I drizzled a little to much, and the heat from the broiler caught the oil on fire from the aluminum foil that the fish was sitting on. This time the fire alarm when off, and I had to dump Evian water all over my burning salmon! My stomach was in knots and I was shaking because I was so nervous that evening. I could have burned my whole apartment complex down! Yikes! 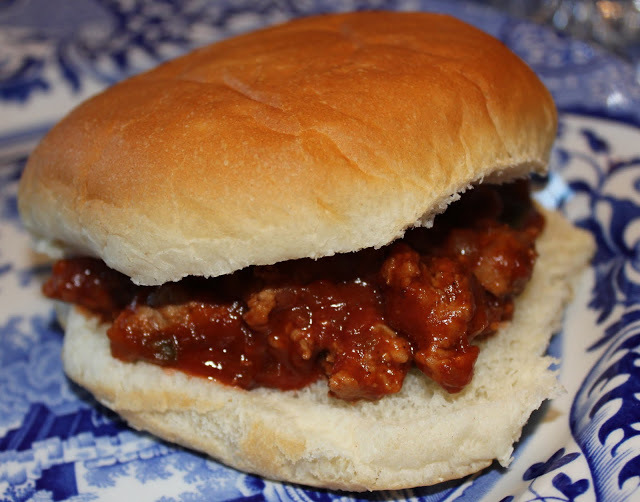 So back to the Sloppy Joes…any man would love it if you made this recipe for him. This recipe says it serves 4, but my husband eats a lot when he likes something, so it only served 2 in our family! Enjoy! Heat oil in skillet over medium-high heat and cook onion and pepper until soft, about 6 minutes. Add beef and cook until browned, about 8 minutes. Add tomato sauce, Worcestershire, chili powder, salt, pepper, and Tabasco. Cook until reduced and thick, about 10 minutes. Heat oil in 12" skillet over medium-high heat. Add onion and pepper and cook, stirring, until soft, about 6 minutes. Add beef and cook until browned, stirring so that the meat breaks up into small pieces, about 8 minutes. Add tomato sauce, Worcestershire, chili powder, salt, pepper, and Tabasco; cook stirring occasionally until reduced and thick, about 10 minutes. Divide between buns and serve.